A collection of thoughts, links, and observations since 2003. Merlin: A-*hem*. Is dis fing on? It is? Oh, good. Ohai, I'm Merlin, and dis my brofur Pyewacket. We's THREE WHOLE MONTHS old, and dat's a longlong time! Our three sisfurs dat we was borned wif are already out ruling houses. Now it's our turn to take ofur ruling DIS house. I is da great magician kitty, and Pye here is my second-in-command. Pyewacket: EXCUSE YOU, I don't fink so! We are equals and we rule togefur! Merlin: You can be my familiar. Pye: Yes, I am familiar wif you. You're my brofur. Merlin: Dat's not what "familiar" means! It's... oh, nefur mind. Pye: Excuse you, I was here first! Merlin: I'll turn you into a toad! Hocus Cadabra! 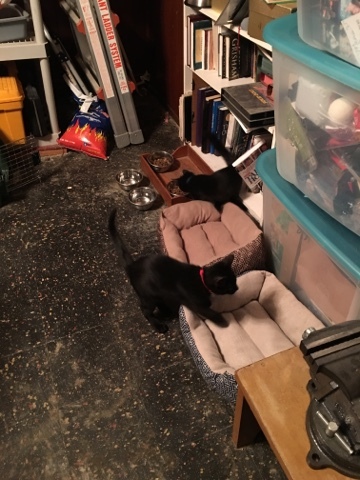 The new Royal Felines are currently exploring the basement. They'll stay down here for a few days until they get acclimated; then they can explore the house. I grieve for my country today. Our Founding Fathers' foray into democracy has been usurped by a narcisstic, thin-skinned, vulgar, vengeful, ignorant, crass, affluenza-ridden manchild. I don't do adult beverages, but I dealt with my feelings today via copious amounts of hot cocoa. There's only so much depression-relief to be gained from consuming carbs, however. So its impact was, necessarily, limited in scope. Drinking enough hot cocoa to drown sorrows THIS all-encompassing would land a person in the ER. On Tuesday night, Baxter went partway up the stairs to the second floor. Captain sat at the foot of the stairs. I became aware of that fact when the dog decided he wanted to return to the living room, and found the cat blocking his way. "Yip yip yip yip yip yip" went Baxter. Captain just sat and looked at him. I sat and watched to see what would happen. To my great amusement, even though the dog has chased the cat in the past, he seems to have found a newfound respect for Captain in recent days. Possibly, this started when Baxter attempted to chase the cat, and Captain just sat there. Either that, or Baxter has a memory of being swatted by the Paw of Doom. I haven't seen the cat smack the dog upside the head in recent days, but it's always possible that there was some Paw of Doom usage when I wasn't there to see it. In any event, Baxter showed enough deference to Captain (and the Paw of Doom) to just yip at him until he finally moved out of the way, allowing Baxter to get past him and enter the living room. 😂😂😂 I have such #spoiledcritters . All I can say is this: C'est vomir. As if burying my late nephew on the morning of my birthday wasn't bad enough. I had to bury my country on the night of my birthday. When you work for a health system with 5 million patients in its database, it's only a matter of time before a name you recognize comes across your desk. And in the words of Forrest Gump, that's all I have to say about that. I listened to music at work today. I plugged earphones into the computer, rather than use my phone, just to see if it was logistically feasible. In early September, I received some outreach that effectively ended the rift I posted about earlier. So why am I no less sad now? I think I'm still in the grieving process for my old worldview. Just like putting a cast on a broken limb doesn't magically, instantly knit the bone back together, the impact of showing me that I can be consigned to the garbage heap, for months on end and without explanation, isn't something that instantly dissipates. I don't trust much anymore. I had trust issues BEFORE this happened. To put it mildly, they're no better now. I do miss the old me, and I miss the way the world used to look. At church today, the weekly bulletin has the scripture quote from St. Paul: "Be not overcome with evil, but instead overcome evil with good". In the same vein, we have Dr. Martin Luther King, Jr.'s quote: "Darkness cannot drive out darkness; only light can do that. Hate cannot drive out hate; only love can do that." We can honor the fallen by remembering both these things before we start promoting hostility. Do, say, and post things that bring people together, not divide people or promote hate and prejudice. This is not a day for hatefulness. This is a day to be reminded of what hatefulness will do if left unchecked. That's what we should be remembering today before we speak or hit the SEND key on a post. May God rest the souls of those who died in the attacks 15 years ago today, and may those who grieve those lost ones be consoled. I see it's been rather quiet in Blogland since late Spring, so let's play catch-up. Early in June, I got word that the permanent version of the temp job I've been doing since December was posted. I applied right away. Fast-forward to this afternoon, when I got the phone call from the Talent Acquisition department. I was officially offered the position. :) Paperwork will be arriving at my home, and the start date as a permanent employee is August 29. Thank God! Now I needn't sit around wondering when things are finally going to advance that next step. It starts with two weeks' vacation. Paid time off. Something I haven't had in a decade. 'Bout freakin' time. I'm also putting in at least one hour of overtime per day, since I have an absolute BOATLOAD of work that needs to be done. I'm working my rump off, but they keep bringing more paperwork. I'm actually going to ask my manager about the status of getting the ladies who work in the call center to assist with scanning. That was a project that was in the works, but I haven't heard anything about it since Spring. I'm trying to clear the backlog of THREE (related) departments, and management wants to fill the call center ladies' downtime with activities like scanning. Let's just say that now would be a really good time for that process to get rolling. I want this backlog GONE, and I only have ONE scanner that can only go so fast. Having said that, scanning could turn really interesting Real Soon Now. At the end of August, the hospital is about to transition to TOTALLY new scanning software, which I have never used nor even seen before. "Congratulations, you're permanent; the day after your start date, we're totally changing every aspect of the scanning process you've been using for the past 8 months", lol. I looked through the PDF file with the instructions for the new system, and I already spotted some things to ask my manager about. The new system will be looking for some data items that I do not need to input right now, and so I want to know how to fill those fields properly when the time comes. Well, one aspect of working OT is that I have to get in extra early... which means I have to get to sleep extra early. So good night! That moment when your hubby spots the FB posts about all your erstwhile friends' field trip. I feel so missed. Not. Loyalty is a figment. What delusion ever made me expect it? No matter. I won't ever go through this sort of disappointment again. You can't be disappointed when you expect nothing. I found out earlier this week that Microsift had embedded a stealth agreement to upgrade to Windows 10, in their pop up "nag" window. If you close the window via the red X, it schedules your machine to upgrade. So I figured it was time to update my parents' 8.1 machine, while we still have some measure of control over when and how it's done. I eventually ended up taking their laptop home with me, as the download was taking eons. Boy, I sure got spoiled by the speed of FiOS, lol. While I waited, Karla called my phone to ask if Mark and I were coming on Sunday. I agreed to go, as I really am only hurt by one person who will be there. Why should I deprive myself of everyone else's company? I do wish I'd hear back from people now and then. But I'm done worrying about it. If someone calls or returns my call, hooray. If not, I absolve myself from the need to fret over it. Mattering is overrated. Acknowledgement is a bonus. IF it even happens. If it doesn't, I had no business expecting or presuming it'd happen anyway. I've learned. Like the book of Ecclesiastes says,"vanity, vanity! All is vanity! ... It's all chasing the wind." This is the lesson I should've learned two years ago, the last time I went through this. I came out of that experience still with faith in people. No more. I learned.Expect nothing of others and you'll never be disappointed. As I scan documents, including consent forms for medical procedures, one question occurs to me time and time again. And the question is this: Why on earth would anyone sign a legal document with what amounts to a random scribble? I don't know about the rest of the world, but when *I* am signing a document, particularly one that is detailing what medical procedures for which I do or do not grant my assent, I want it to be CRYSTAL CLEAR that I have signed the document. Not only is my handwriting going to be recognizable as characters belonging to the Roman alphabet, but I'm going to take extra care to ensure that the writing is legible. Judging from the scrawl on many of these consent forms, I am decidedly in the minority. And I don't merely mean "horrendous penmanship that resembles a signature jotted down in great haste". I mean "squiggles that resemble nothing so much as a freehand approximation of a sine wave". It just astonishes me to no end, every time I see it. Fortunately, there are printed stickers on 99% of the forms, so I don't have to rely on deciphering that which is utterly illegible. And on the ones that haven't got a sticker, normally I can go to the doctor's schedule for the day and figure out whose form I'm looking at. Mind you, the DOCTORS also often sign in shorthand. But at least the marks they make are relatively consistent from one form to the next. I've learned to recognize a lot of the doctors' personal hieroglyphs, just from seeing them on so many forms. That moment when you think you've heard from someone on Facebook for the first time in months, only to belatedly realize that Facebook was showing you a memory from 2 years ago today. I think I've hit on the formula for who cares and who doesn't. There are, of course, certain relatives who care, regardless, fortunately. But outside of those, it seems to be the folks for whom I am doing something who take the greatest interest in my existence. If I'm not enhancing their life actively, then at best, I'm just some nice person relegated to the periphery. Or I'm just "out of sight, out of mind". Everyone not related to me is fitting into this pattern neatly and consistently. It suddenly makes sense. How did I take so long to understand something so basic? Now that I get it, I can acclimate to it and adjust my expectations accordingly. Then I won't feel hurt or disappointed anymore. One positive to report: this is the first time in forever that I've gone through a grieving process without ONCE pondering how and when to cash in my chips. That's more significant than I can express in words. Maybe it's that I no longer feel I'm dragging everyone down with my presence. To drag everyone down, I'd have to matter (albeit in the negative sense of the word). And... well, an electron microscope wouldn't find evidence of that whole "mattering" thing. So I guess I'm in the clear. There's no need to make everyone's life easier by applying a drastic solution, because everyone is already doing just fine without me around. It's all good, now that I understand life better. Still sitting shiva for my old worldview, here. Time passes and sadness diminishes while resignation develops. At some point, the drawbridge that leads into my inner sanctum sanctorum is going to be shut; even now, it slowly rises as the wheels turn. Once it's closed, I'm not entirely sure what would inspire me to reopen it to admit new, unproven people. If four decades' worth of friendship wasn't enough to stop me from being thrown in the trash, what's to make me believe that some new person who arrives in my life would be reliable over the long haul? Or even the short haul? My feelings might matter to a very, very select few (and I've learned that it's fewer than I thought), but *I* happen to be one of those few who cares if I'm hurt. I don't need to be covered in footprints from other people's cleats, TYVM. 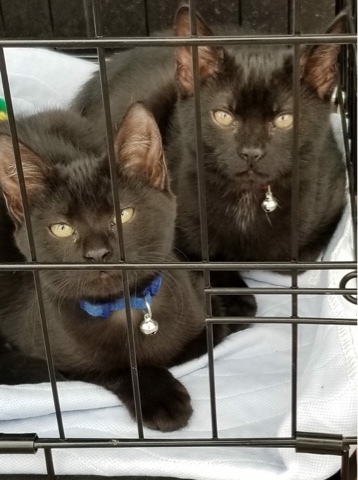 I am seeing on the PAWS mailing list that there are two new kittens at the PetSmart site. If they're still there on Sunday, I look forward to meeting the widdle guys. Space was created because one of the kitties who was sneezy was sent back to the Grays Ferry clinic where there's a vet. When a kitty is adopted or goes back to the clinic, there is no shortage of available felines to take its place at PetSmart. Mark and I have to go buy a microwave oven tonight, as our 18-year-old one bit the dust this morning. If we go to a store near the PetSmart, maybe we can swing by and have a look at the kittens then. If not, I'll see them on Sunday. After a day, or has it been two? of cogitation, I've come to realize that mattering is overrated. Seriously. Why should I even care if I matter to anyone else? That's just letting my happiness depend on what someone else does. How long have I been declaring that other people's opinions of me are none of my business, but it took this situation to really, truly internalize that lesson. So I'm just going to be myself. If other people like it, fine. If they don't like it, also fine. I can't keep banging my head against the wall and thinking, "Oh, but if I do this, they won't LIKE me anymore?" Minus one text conversation, there are people I haven't heard from in over two months, and they seem to getting on just fine without me. Okay, then... If that's how it goes, I accept it. At least it didn't come as a surprise this time, as it did two years ago when I was pushed out of the group. Everybody got on just fine without me around then, too, so why should this go-round be any different? I didn't expect it to be, and so far, I haven't been disappointed. It looks quite the same as before. " So I'm looking into other ways of making a difference in the world, not because I expect anyone to remember me... I've already learned that lesson: that's not gonna happen... but because I'm determined to leave the world a better place than I found it somehow. Who cares who remembers me after I'm gone, unless they're having a Mass said for my soul. I hope at least someone remembers to do that. It amuses me to think that the things I post on the blog are most likely going to go unnoticed by the very people who might actually give a hoot about what's being said here. But that's OK. Maybe someday, someone from IRL will click the link in the signature of my emails, and be surprised about what's actually going on between my ears. Like today, for instance. The grieving process for that spat of some months ago still rears its head now and again. It's just like a grieving process for someone who has died... you can be fine for days at a time, and then something crops up and you get another wave of it. But who has died? Is it the person I thought my friend was? Or is it the old me that had a more trusting worldview? I kind of think it's a bit of both. I miss that old me, and I don't honestly know what to do to get her back. And the person I thought I was friends with must have been a figment of my imagination, because if he was real he would never have spoken or turned on me like he did. Which, of course, opens the door for me to question my own abilities in judging people's character and motives. It should come as no surprise that as I write, I am singularly disinclined to invite new people into my life's circle, lest I accidentally misjudge someone else and bring on another round of this sort of thing. It's not safe to let new people in until I have finally, completely, gotten it through my thick head that unless I'm perfect and never make a mistake in the other person's eyes, I am subject to rejection and banishment. That's how people are. If your 42-year friends will do that to you, what hope is there that new people will behave any better? The less emotional investment they have in you, the quicker they'll cut you loose. Best to keep interactions to "hello", "goodbye", the weather and everyone's health. Then nobody gets disappointed. But enough depressing stuff. Let's move on to the positive. I started volunteering at the PetSmart yesterday. They have nine kitties on the site, and one is cuter than the next. I made sure they were all fed and watered, and have clean cages and litter boxes, and then embarked on giving each kitty some time outside the cage, for those who wanted it. One cat had no interest in leaving her cage, but the others were more than glad to explore and get doted upon. I also showed a few kitties to interested parties, and the cats in question were more than glad to turn on the charm. :-) But just one person filled out an application on the spot and gave it to me. I think the other two (a mom and small daughter) may have taken a blank application to fill in at home. When someone fills out an app, I then photograph both sides and email the images to the person who processes the applications. It can take a few days to get approved, depending on things like being able to contact the person's vet and obtain vet references. I will be going every Sunday. I am hoping to get word of at least one of the kitties being adopted by the time I get back there next week. They're all so cute and they all love attention. They deserve loving homes where they can doted upon all day, every day. Every once in a while, I have a minor mishap that causes my left knee issues to flare up. I had one of those this morning; I think I hyperextended the knee a bit. Ouch. Phooey. It's a few hours later now, and the knee is starting to curse and swear. Pain relief ointment, here I come. Fortunately, I bring my cane with me when I commute now, largely because I have discovered I can no longer safely stand on a moving bus without something to lean on. That goes double for the fact that any of the buses I take will, at some point, make a turn. Standing unsupported on a TURNING moving bus is just asking for an accident to happen. Hence, the cane. Having said all that... I scanned some medical records for someone whose lists of allergies and current prescriptions was three typed pages long. I think I'll stop complaining about the knee pain now, lol. My list of medical gripes pales in comparison to that! In other news, I had a volunteer orientation for PAWS on Wednesday night. I will begin volunteering at the PetSmart near my home, where PAWS has got adoptable cats. Need I say that I want them all? They're just too darn cute. Most of them are VERY amenable to getting doted on. One seems a little shy and doesn't want a lot of interaction. I'm now on a Yahoo mailing list where volunteers summarize their shifts, and they have remarked the same about that kitty. Here's hoping he warms up to attention once he's settled in a bit more, so potential adopters can dote on him and fall in love, as he deserves. Most people celebrate this day as Cinco de Mayo. I celebrate this as the anniversary of starting to blog. Yes, on 5/5/2003, I wrote my first blog post. Not only was yesterday a productive day, in terms of the amount of records I got scanned into the system, but I spotted a typo in one of the forms that patients must sign in order to give consent to a particular procedure being done. Happy Birthday in Heaven, Aunt Joanne. This is the one-year anniversary of the last time I saw you in person. Or should I say, the last time you saw me. The next times I saw you were all in the ICU, after the choking-on-food incident that left you without detectable brain function. I'm sure your spirit knew we were there, but your body had lost all capability of perceiving its surroundings by that point. Say "Hello" to Grandmom and Grandpop, and Aunt Theresa and Uncle Nicky, and Great Grandpop. Noticing that I've been unfriended by someone who picked an argument with me last month. Disappointing. But hey. What can I say? I'm taking the stance that it's not my circus, not my flying monkeys. I scan a lot of documents related to surgeries which have been performed. Specifically, Mohs surgeries, which are a method of excising skin cancer. These documents are multi-page affairs which include color photographs of the surgical area. Sometimes, the lesions are small or are in an unobtrusive location. Other times, they're either significant in size, and/or in a really prominent place on the body (like the face). But I realized something a few days ago. In some of these post-surgical photos where the patient's face is visible, it's clear that the patient is SMILING. I don't mean a great big "taking a selfie at a fun party" sort of smile. It's far more subtle than that, but it's there. When it happens, there's no missing it. Of course, I have no idea what the person's inspiration is when they choose to smile. Perhaps it's a reflexive "smile for the camera" thing, maybe it's a "BLEEP YOU, CANCER" stance, maybe it's putting a brave face on a tough situation, or it could be relief that the surgery is done and they can move on to the next phase of putting cancer in the rear view mirror. Maybe it's a bit of each. But when I see one of those images with a smile in it, I have to do a self-evaluation and realize that compared to what this person is going through, my issues are minor. The biggest source of pain in my life right now is that someone hurt my feelings. Do you think, as I do, that the people in these photos (smiling or not) would trade problems with me in a moment? So what right would I have to walk around moping or frowning, hauling a big raincloud above my head everywhere I go? So don't expect my postings on here, on Facebook, or anywhere else, to look significantly different. I can deal with my hurt feelings without dragging everyone else down. Maybe I'll even smile. An announcement was made over the PA of the Regional Rail train: "The first car on this train is the designated Quiet Car". So why were the train's speakers blasting this particular datum at a volume that would've drowned out a jet engine? RARF! I'm Baxter, the big tough dog. I'm sneaking onto my Mom's computer when she's not looking, so I can write this post about my day. I'm a big boy. I'm part Chihuahua and part Corgi, and you know how big I am? Almost as big as a CAT, and cats are HUGE! Today, I protected the house. It started when Daddy stayed home from work. Then late in the morning, he made me go in my crate. That's unusual, since I normally only sleep in there at night, but Daddy said so, so I went in. And right after that, there was a knock on the door. So of course I barked Big Tough Barks. And Daddy opened the door and STRANGERS walked in! Two of them! Like they owned the place! So I gave them even bigger, tougher Big Tough Barks, and Big Tough Growls, too. But that's not the most shocking part. Those two Strangers, they actually TOOK OUR REFRIGERATOR! Can you believe the nerve? They had to wheel it right past my crate to get it out the door, so I gave them my biggest, toughest Big Tough Barks to tell them, "You put that fridge right back where you found it! Right back, do you hear?" Well, you bet I scared them. I scared those Strangers so much that instead of putting the old fridge back, they immediately brought in a bigger, better, shiny brand new refrigerator instead! And I mean IMMEDIATELY! How do you like THAT? All because I'm big and tough and I told them off like a good guard dog should. Then after they put the big new shiny fridge in, the Strangers went away. I sure scared them good! That's what they get for trying to steal refrigerators. I bet they'll never try THAT again! So now we have a big new fridge, and I am Very Proud Of Myself. Last winter, we heard about the Polar Vortex repeatedly, a weather pattern that drove temperatures down to record lows. We dealt with lots of Polar Vortices during the course of the winter last year. This year, it's more like a Bipolar Vortex. Two days ago, the temperatures were above 60F. Today, it's freaking snowing. And sticking (at least on lawns and cars, as I write). What in the blue blazes is going on with the weather this year? This is the most bizarre winter weather I've ever seen. I just hope it doesn't goof up SEPTA too badly. With luck, this snow will quit long before the workday ends. 'Splain to me how a dermatology clinic uses restroom soap that causes dry hands. Yeah, I know, the larger medical system is in charge of these purchases, not the individual clinics. I still find it amusingly ironic. Pass the moisturizer. When the indicator button on the scanner lights up green today, after being illuminated in red yesterday (and subsequent to which, the scanner didn't work), that's progress. The tech support guy is working on it now. Then I can scan charts on my own workstation, in my own office, instead of the shared scanner at the nurse's station. OK, whose idea was the SLEET? What the Sam Hill? On my lunch break, I went to get a TrailPass for February. It was freaking SLEETING out there. Dagnab it. Like the 22.4 inches of snow we got a week ago weren't enough, now we get more freezing precipitation. Well, at least it's not accumulating, so that's a good thing. It's also a good thing that for only $10 more than a monthly TransPass, which allows for use for buses, trolleys, the Subway and the El, a Zone 1 TrailPass will allow all that plus access to Regional Rail trains in Zone 1. That means I can take any Regional Rail train from where I work that goes to Jefferson Station, without having to tear my hair out dealing with street traffic. From there (11th and Market), I can get a 17 bus. Given what the bus stops look like after the freaking blizzard, that ability would've been welcome this week. Some of those stops are a disaster because they were plowed in. The one at 30th and Market, where I normally catch a bus to get into Center City, looks like the Arctic tundra right now. I swear I spotted a polar bear walking through it. Unbelievable that they haven't cleared the snow mountains away from a bus stop where no fewer than six buses pick up passengers... yes, I know the whole city is a mess, and I appreciate that. But I would've thought that a major location like 30th and Market would get priority when the snow clearing plans were made. Well, it's no matter. Starting Monday, I have the option of taking the Regional Rail OR buses to get into Center City. I'm counting that as a WIN. Another good thing: GIRL SCOUT COOKIES. :-) Like the ones I'm going to pick up when I go to Joe and Jean J's tonight. (I still work with my deaf-blind friend on Fridays, even though I've been working at my new temp job.) Gotta remind myself to hit the MAC machine before I leave here. Hmm. Lunchtime's just about over. I'd better hit SEND and post this. The totals are pretty much in. We scored 20.8 inches of snow. I'm not interpreting tomorrow. Between here and the parish where I interpret, there are no guarantees that all the streets will be passable. Getting stuck in snow, in these temperatures, is a Certifiably Bad Idea. Meanwhile, I fill my weekly pill minder on Saturdays. Once again, I am mystified by the fact that the bottle of glucosamine chondroitin, which is for joint pain, has a tamper-proof seal that requires an act of God to open. Exactly how are people with hand pain supposed to manage this feat, short of resorting to explosives? Even Mark, whose hands are not in chronic pain, couldn't pull the darn thing off the bottle on the first three attempts. Jiminy H. Cricket. Is this a ploy to make sure we keep needing to take supplements for joint pain? An hour after filling the pill minder, I was STILL sore. Hello, BioFreeze ointment. The city and state are prepping for the major blizzard that's supposed to arrive tonight, and last well into tomorrow. The break room here continues to astound. 55 degrees this morning... edging gently upward to 56 degrees now. Yikes! Pardon me while I make more tea, stat. I'm a married lady with two spoiled cats and a spoiled dog, living in South Philly. I like reading, writing, music, hockey, and techie stuff. On any given Sunday morning, you might find me as the sign language interpreter in the church where I grew up. I'm there on two Sundays per month. During hockey season, look for me to be watching the Flyers on TV or watching Phantoms games online. Or, on a really good day, watching my teams in person.